The left picture is a former Caterpillar folded core design that has been converted to a standard core design via a simple tank adapter. On the right is a large dual tower unit made up of 3 cores bolted together via 1" spacer plates. These units are 4' high and about 15' long. It takes both of these units to make up one cooling unit..
Large industrial type radiators is our specialty. 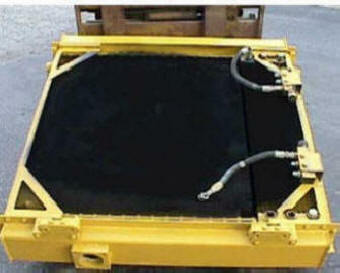 We can handle any size that you have from a small forklift radiator all the way to a Caterpillar D-11 and larger. 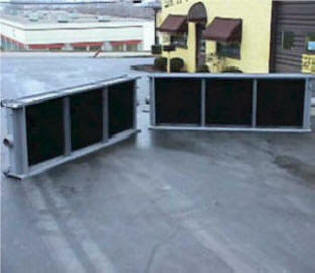 In our area, we are the industry leader in industrial radiator repair. We have the ability to recondition, recore, or repair your radiator. We offer pickup and delivery service for our industrial customers. Nothing you have is too big for us! We also pride ourselves on prompt turn around time. We understand that when your equipment is down, you are loosing money, so we try to provide a one day turn around time or when possible, same day turn around time. Call us for price quotes on your large job! If you have dealt with any of the Caterpillar Modular radiators (folded core design), then you know just how difficult they can be to keep clean. The very design of the folded modules is its downfall. We now have the capability to convert these over to a standard core design via a small adapter tank that fits directly into the existing tank. We can make this conversion on radiators with or without oil cooler modules. *Testimonial letters are available HERE.